The Davis is one of the most historic and architecturally distinguished buildings in downtown Dallas. The eastern, cupola crowned portion of the structure was built in 1926 as the headquarters for Republic National Bank. This classic revival building was the second tallest in Dallas when it was built. 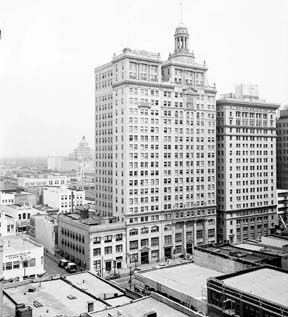 When the west extension was added in 1931, the Davis became the largest office building in the state of Texas, and served as the bank headquarters until 1954, when the bank moved to a new facility. At that time the old bank building was renamed in honor of Wirt Davis, longtime chairman of the bank. Reflecting its role in the emergence of Dallas as a major city, the Davis forms part of a core group of historic buildings in the vicinity of Main Street near Akard and Ervay. These include the original Neiman Marcus store; the Adolphus Hotel and the Magnolia Building topped by its signature flying neon horse. The original building was designed by C.D. Hill, a noted Dallas architect, who also designed the Municipal Building, Houston's Warwick Hotel and Fair Park's Coliseum. Hill's work also included a number of distinguished residences in the Lakewood and Highland Park areas of Dallas, as well as the Oak Lawn Methodist Church. During its early years The Davis was home to the Republic National Bank, but also every major insurance company in the southwest including; Aetna, Travelers, and American Fidelity. Other tenants were, Texas Baseball League, Coca Cola Bottling and the Dallas Letter Shop. The Historic Davis Buildings housed four Dallas Mayors and was the birthplace of Texas Instruments. After a glorious history of supporting the elite of Dallas' business leaders, the building fell onto hard times in the late 1970's with an occupancy of 30% in leased office space. Announcements of revitalization in 1983 turned downward with ownership changing into foreclosure in 1986. A "For Sale" sign was hung on the building for 7 years, until a new renovation plan appeared in 1993. As many times before, that package did not come to fruition and the building again was abandoned. The current refurbishment began in 1997. Feb 15th 1926 - Republic National Bank officially opened its doors celebrating 6 years of business in Dallas, and a beautiful new structure. C.D. Hill was unable to see his projection to completion due to his untimely passing in January of 1926. A roster of many prominent Dallas companies leased office space in Dallas' newest skyscraper. November 1929 - The 19th, and 20th floors were added in the midst of the Great Depression at a cost of 1.5 million. The addition was completed in 1931 making this the largest office building in Texas at the time. 1947 - A Railway window was opened in the basement and soon after Republic National made the decision that they had outgrown their space and acquired a site for new construction at Pacific and Ervay. 1954 - Republic Bank vacated the Building at 1309 Main street and it was re-named "The Davis Building" after long-time chairman Wirt Davis. Ownership was taken over by Wirt Davis II, Percy Davis, Charles Sammons and H. Harrison. 1965-1967 - Plans began for renovation and modernization of The Davis Building. The underground tunnel was expanded to connect The Davis to One Main Place. 1970-1993 - The building changed ownership many times. From Louis Reese to Bruce Wiles to Ken Graham and Ben Cooper. All had hope of major renovation but were financially unable to complete the work. The building finally fell into foreclosure in 1987. And the search for a new owner began. 1991 - The Davis Building was used as a part of the set for the movie "Touch and Die" featuring Martin Sheen. The buildings persona in the film was The western Morning News. 1991-1996 - The building was purchased 2 more times in hopes of revival by Sawamco and then by J.L. Williams- but both times it was quickly sold. 1997- The Building was purchased by Hamilton Properties with plans of renovation in to apartments. Construction began in March of 2002 and was completed by September 2003. Move-ins began and the renovation was a success!